Heat oven to 350 degrees F. Line muffin pan with 10 cupcake cups. In medium bowl combine flour, cocoa, baking soda, and salt. Set aside. In larger bowl combine sugar, buttermilk, oil, egg, and vanilla until smooth. Add dry mixture and whisk until smooth. Spoon batter into cupcake cups, dividing evenly. Bake 25 minutes or until center is just set. Let cool in pan for 10 minutes and then transfer cupcakes to wire rack. Cool completely. While cupcakes are cooling, prepare the buttercream frosting. Combine sugar, egg whites, and salt in bowl of electric stand mixer. Set bowl over pan of simmering water. Gently whisk until mixture registers 160 degrees F on instant-read thermometer. Immediately transfer bowl to electric stand mixer. With whisk attachment, whip on medium-high speed until mixture resembles consistency of shaving cream. On medium speed, add butter one piece at a time, until combined and creamy. Whip in peanut butter and vanilla, and beat until smooth. Transfer buttercream to pastry bag fitted with a plain 1/2-inch tip (#808). Pipe 1/3 cup frosting onto each cupcake. Chill cupcakes in refrigerator until buttercream is completely firm, about 1 hour. Once the cupcakes have chilled, make the chocolate coating. Place oil and chocolate in a medium bowl and melt over a pan of gently simmering water. Stir until chocolate has melted and mixture is smooth. Transfer to a large coffee mug. Holding cupcake by the bottom, carefully dip into the chocolate. Be sure to submerge all of the buttercream. Pull up and hold for a few seconds to let excess chocolate drip off. Transfer to cooling rack and repeat with remaining cupcakes. 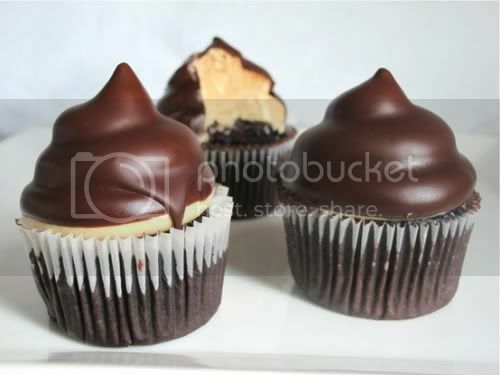 Before serving, let cupcakes rest a few minutes so chocolate can set. I am going to make these tomorrow! Yum!!! You don't have a Pinterest button. But I will share on my boards! :D Looks too yummy not to share!